The NFL was rocked yesterday by the death of 12-time Pro Bowl linebacker Junior Seau, whom police believe shot himself in the chest with a handgun. 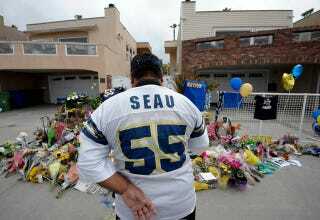 But while the great majority of fans and San Diegans have used the occasion to mourn his passing and remember the better days of a Charger legend, a couple of sickos have apparently decided to have folks believe Seau's death was somehow foretold by (you guessed it) Craigslist postings. First off, let's be clear that it is extremely easy to edit Craigslist postings after the fact, in the sense that these posts could've read completely different when they were posted and we would all be none the wiser. Got that? Good. The first posting "appears" on May 1, under the headline "Junior Seau (I Predict )"
2Corinthians11.7Jesus will take Junior Seau today. Point is, these were probably written, to an unscientific degree of 99.9 percent certainty, by a couple of sick bastards looking to send a chill down people's collective spines. (In that sense, mission accomplished). But should anyone consider these to be legit? No way.